Razor rash, also known as razor burn, can affect anybody of any age. It's the red rash you may experience after shaving an area of your body. However, there are some effective remedies available when it comes to treatment and prevention. Razor burn consists of small, red bumps that can cause itchiness, burning, tenderness, or swelling. You can experience razor burn anywhere you shave, whether it's your face, legs, underarms, bikini area, or another part of your body. Razor burn is not to be confused with razor bumps, which are the result of shaved hairs growing back and becoming ingrown. These ingrown hairs usually occur after shaving, tweezing, or waxing, and may look raised like pimples or acne. Even though razor rash is an irritating and frustrating condition, it usually goes away by itself with time. However, there are some things you can do in the meantime to help treat it. Avoid shaving, touching or scratching the area - If you avoid irritating the area further, then this will give your razor rash time to heal and reduce the risk of infection. Apply a cool compress - Wet a cloth with cold water and then wring off the excess before applying to the irritated area to soothe it. It will also relieve any itching you might be experiencing. Opt for natural astringents - Natural astringents are supposed to reduce inflammation. Try apple cider vinegar, equal parts tea tree oil and water, or witch hazel extract. Apply with a damp cotton ball. Oatmeal bath - Oatmeal is well-known for reducing itchiness and helping improve other skin conditions. Soak in an oatmeal bath for up to 20 minutes. Use natural oils - You can use natural oils to soften and hydrate the skin, thus relieving itchiness, tenderness, and burning. Choose from avocado oil, coconut oil, olive oil, or sweet almond oil. Invest in an over-the-counter lotion - Emollients, such as unscented lotions, aftershaves, and moisturizers, can help to relieve razor burn. Baby products, like baby oil or diaper rash creams, can also be applied to the skin to soothe irritation. Furthermore, products containing hydrocortisone can be effective when it comes to reducing swelling and redness. Shave as soon as you've showered as warm water opens your pores and softens hair. Use a lubricant to shave with, like a shaving gel, cream, or oil, so that your razor effortlessly glides against the skin. Choose a high-quality razor that is clean and free of soap or hair. 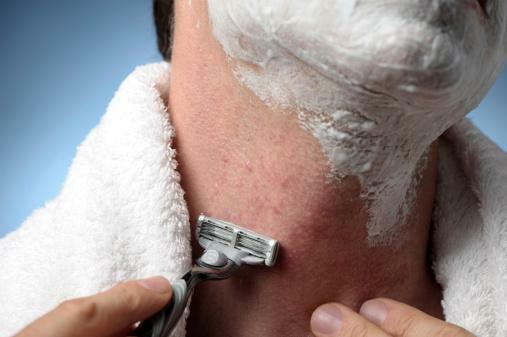 Avoid pulling the skin tight when shaving. Use small, light strokes in the direction that the hair grows and rinse your blade regularly. After shaving, rinse your skin with cold water or apply a cold compress as this will close your pores. Then make sure you apply a gentle moisturizing product that will hydrate the area. Avoid using products that contain colors, fragrances, alcohol, or other skin irritants on the areas of your skin where you shave. Replace your razor or blade frequently to avoid the buildup of bacteria. Regularly exfoliate your skin to remove dead skin cells and prevent ingrown hairs. Even though razor rash can cause discomfort in a number of ways, it usually goes away on its own. However, you can speed up the recovery process through effective treatments. You can also put certain preventative measures in place to reduce the risk of experiencing razor burn again.